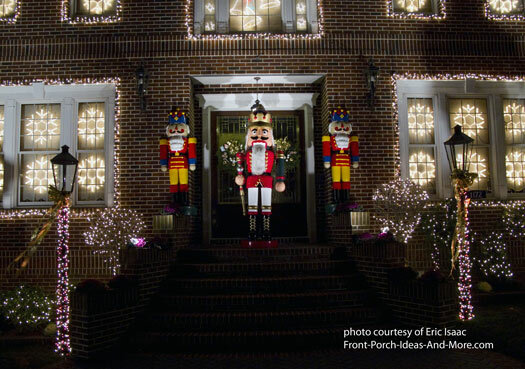 Outdoor Christmas light decorating ideas can be found in neighborhoods everywhere. 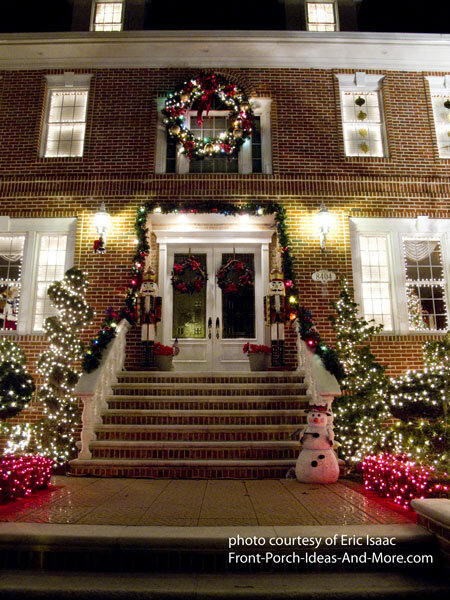 Christmas decorations, especially beautiful outdoor lighting displays, brighten the holiday season like no other decoration can. 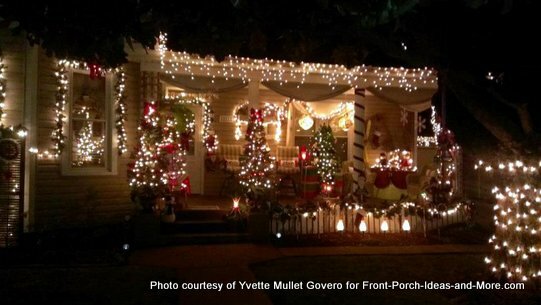 Porches are a perfect location for holiday lights. 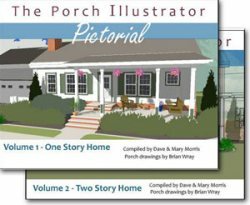 Let your porch sparkle and twinkle. You will get ooohs and ahhhs from your neighbors and passers-by. 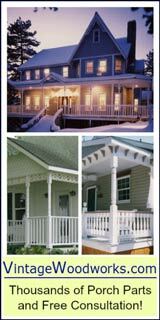 Lights strung across the top of your porch, along railings, and wrapped around columns add beautiful charm to your home. 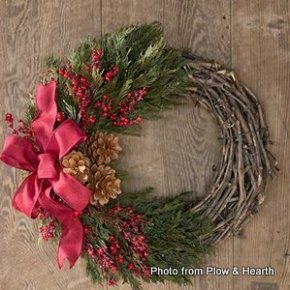 We know you'll find delightful tips for Christmas decorating and ideas to help you celebrate the season. Isn't This a True Holiday Delight? 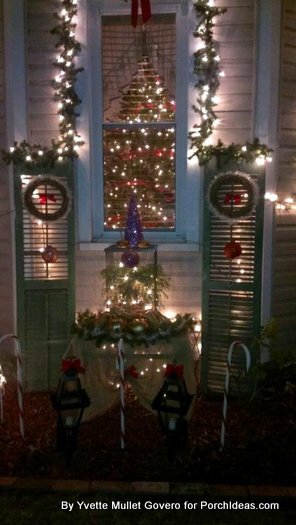 Want some outdoor Christmas light decorating ideas? Well, there are a bazillion! 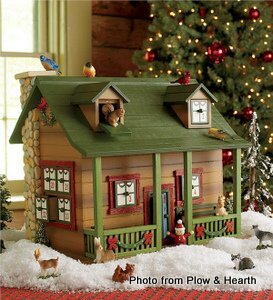 Choose a theme, for example all mini-lights, or mix and match to create your own winter wonderland. 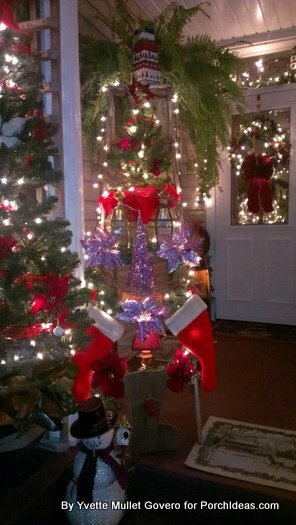 Holiday lights are reasonably priced so no matter your budget you'll be able to add some sparkle to your porch this year. 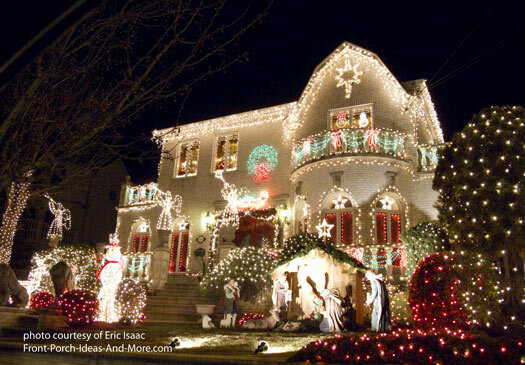 The Christmas light ideas as shown below create a definite magical scene. Yours may not be as plentiful but this is sure to attract a lot of attention. We like the lighting display below too. 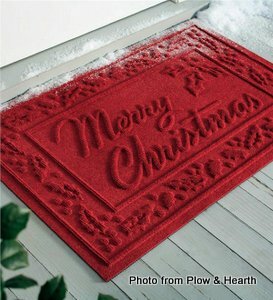 Not as ornate as the one above but it surely evokes a fun holiday spirit. 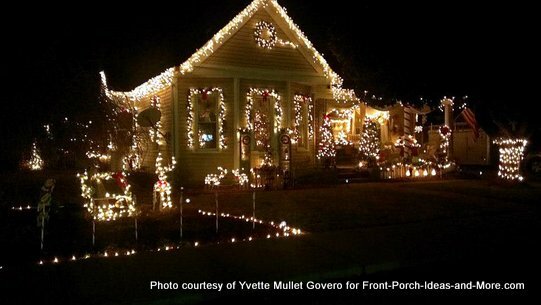 We are excited to share Yvette's Christmas lights with you. 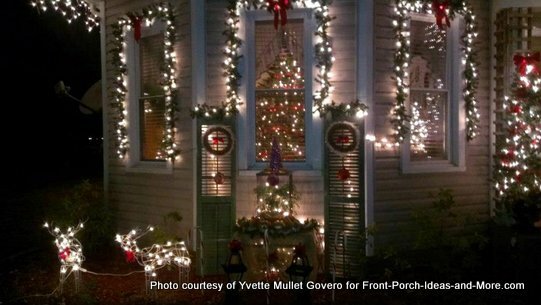 She has created a magnificent display that I am sure is the envy of her neighborhood; we hope you enjoy them too and glean ideas for your own holiday lighting. Yvette created a brilliant and fun lighting display! One that we both enjoy. How Many Kinds of Christmas Lights Are There? 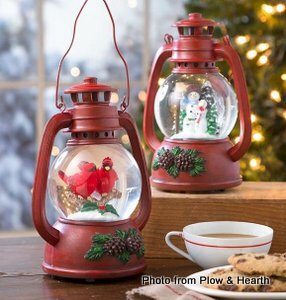 There are ceramic Christmas tree lights, twinkle, crystal cut, bubble lights, and string lights, lights that stay on and lights that flash, rope lights that chase, multi color, big lights and little lights. And don't forget the ever popular basic, small colored or clear lights. There are LED Christmas lights, net lights, solar lights, icicle lights, button lights, cascade lights, painted lights, and tear drop lights. 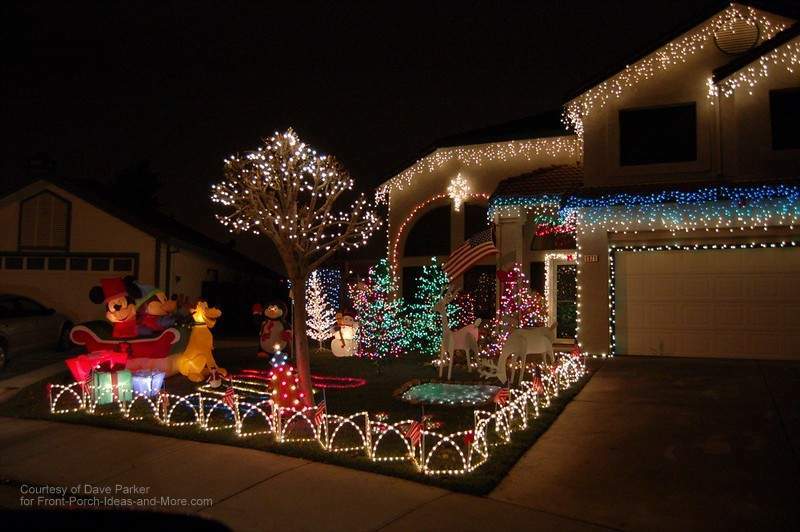 How's that for outdoor Christmas light decorating ideas? Wow! 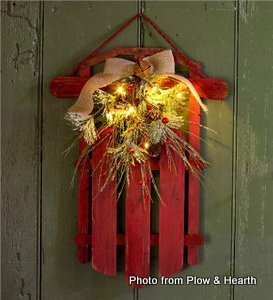 See more of our Christmas light inspirations. 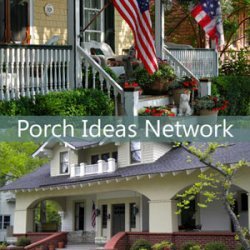 We hope our outdoor Christmas light decorating ideas and tips will inspire you to decorate your front porch for Christmas. 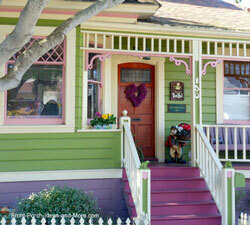 As you can see, it is easy, fun, and can be rather inexpensive too. Put them all together and the effect is something like this. We've used rope lights around columns. 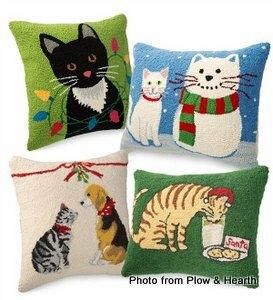 They work really well and are easy to attach; just wrap and attach at the top. 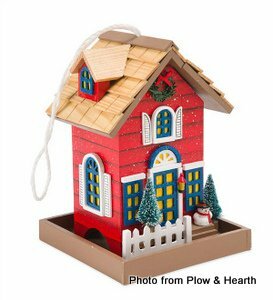 Rope lights chase, that is, they blink on and off in consecutive order and add a lot of pizzazz to your porch. Rope lights also work well along railings. 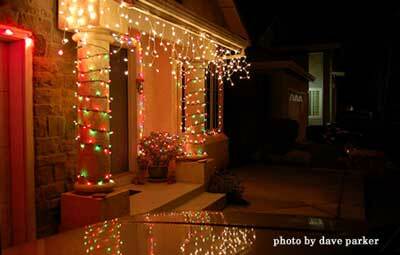 Will your outdoor Christmas light decorating ideas include icicle lights? 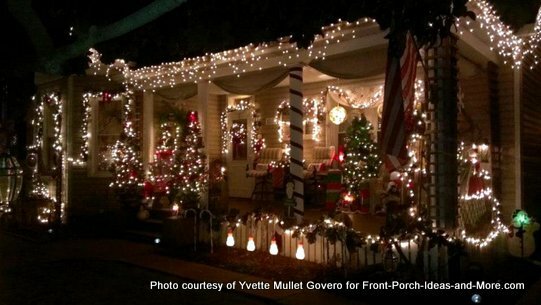 Icicle lights hung from porch eaves give a great effect no matter where you live. 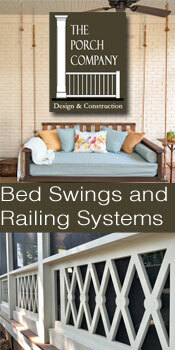 You can also hang them from your railings as well. 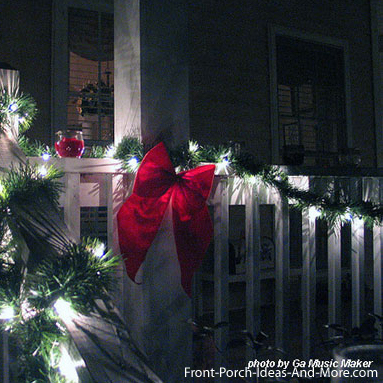 You can create exquisite outdoor Christmas lighting decorations on your porch railings. 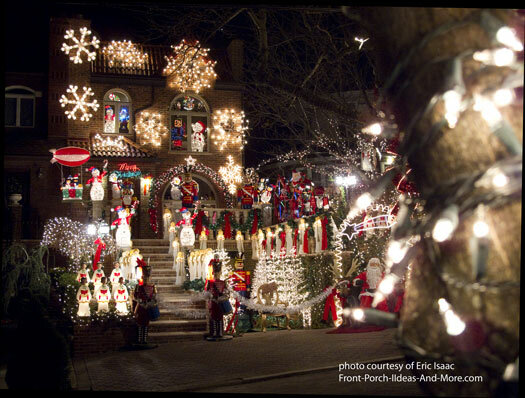 Unfortunately many homes will go up in flames during the holidays due to faulty lights or overloaded circuits. All are preventable so please don't let it happen to you. 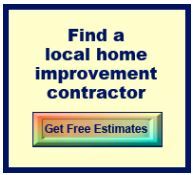 Circuits in older homes carry a maximum of 1800 watts each. 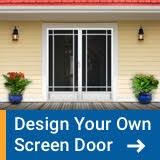 Most newer homes can handle 2400 watts each. 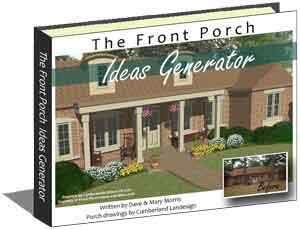 If your porch receptacle even looks close to something out of a Chevy Chase movie I know you've probably far exceeded its capability. 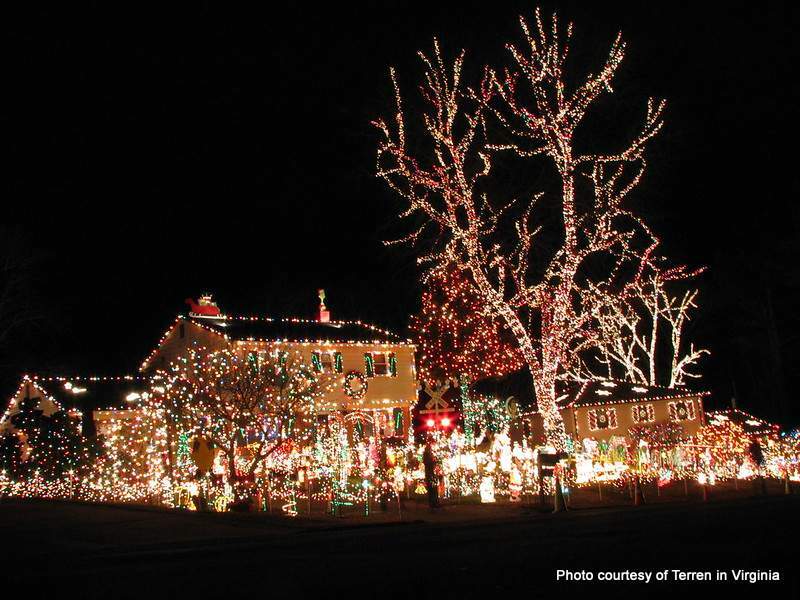 To determine how many watts you are using, multiply the number of holiday bulbs by the number of watts per bulb. If you're not sure of the wattage, use 10 watts per bulb just to be safe. When you're calculating the total, don't forget to include appliances, normal lighting, and other electrical equipment already running on the same circuit. Make sure all lights you purchase carry the Underwriters Laboratories (UL) label, which means they meet UL safety requirements. Check for broken or cracked sockets, bare wires, and loose connections. Either discard or repair damaged sets of lights before using. Check your light's labels to ensure they have been certified for outdoor use. Use hooks or insulated staples to hold lights in place. Do not use nails or tacks. Each receptacle used for your light must be ground fault circuit interrupter (GFCI) protected. See our Electrical Modifications Guide for more information about your electrical system. Light your tree only when you are at home and awake to enjoy it. As an extra precaution, keep a fire extinguisher handy, and be sure your home's smoke detectors have new batteries and that they're working properly. Turn Christmas lights off during the day or when you are away or when you are asleep. Timers are a simple way to do this and also are a safety measure since lights can cause fires if not used properly. For safety's sake: always unplug your lights before going to bed or leaving home. Along with smoke detectors, a fire extinguisher should be in every home. 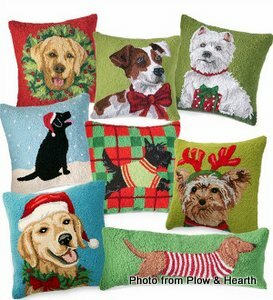 This holiday season, why not be good to yourself and your family and purchase one. Don't be the one standing in the street in your PJ's as your house burns down saying "If only I had spent a few bucks on a fire extinguisher." 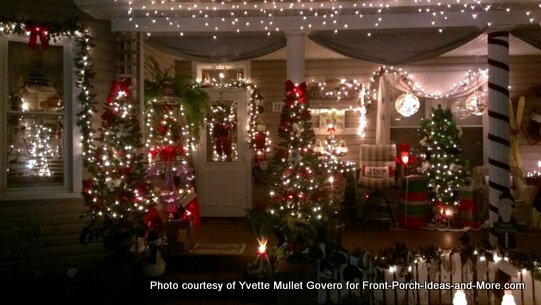 We hope you enjoyed these outdoor Christmas light decorating ideas! 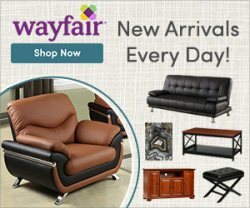 Use our photos to get outdoor light decorating ideas….